Briggs Woods Conference Center-All about our 11,250 sq. ft. facility! Your premier meeting and event location! 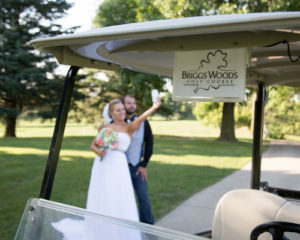 Briggs Woods Conference Center is a brand new, state-of-the-art, full service venue serving Central and North Central Iowa. Briggs Woods Conference Center is an 11,250 square foot facility surrounded by Briggs Woods Park and overlooking Briggs Woods Golf Course, all within the pristine Boone River Valley. The facility boasts three meetings rooms, a board room, large registration areas, a Grand Ball Room and an additional breakout room in the golf course facility adjacent to the conference center. Located a short 12 miles from the Interstate 35/Highway 20 intersection, Briggs Woods Conference Center is your premier meeting and event location. We are dedicated to providing you with a top-notch facility, mouthwatering cuisine, impeccable service, and exceptional amenities to ensure your experience exceeds expectations!